The City of Sebastopol either inherited or received a gift of the property now occupied by the Sebastopol Area Senior Center at 167 N. High Street. I have not seen a copy of the deed, but I have been told by a former city manager that the conveying document provides that the property can only be used as a senior center. Although the present corporation raised the money and paid for the new building on the property, it is owned by the City of Sebastopol. The Senior Center has a 20-year lease on the property with rent at $1 per year. The Senior Center was incorporated on August 13, 1969, under the name of The Burbank Activity Center. There were 10 incorporators who signed the original articles: B.G. Griffith, Lloyd M. Allen, John R. Crump, Billie Johnson, Agnes B. Gilman, Ena D. Walton, John H. Porter, Warren Randall, O. Walter Walton, and Clyde Adams. The IRS granted the new organization an IRC 501(c)(3) exemption as a charitable organization on November 24, 1969. Research determined that the charitable exemption was suspended two years later for not filing tax returns. When an effort to raise money for the new building project started, a member of the Board contacted the IRS, and arranged to have the suspension lifted so that donors could receive a tax deduction for their donations. It is still valid. The Senior Center has always been at 167 N. High Street, which was an approximately 100-year-old former residence. This was the first senior center in Sonoma County, and the original Articles of Incorporation state that the purpose of the organization is "to engage in activities which will promote the general welfare of the elderly residents of the County of Sonoma and neighboring Counties…" At that time the focus was not limited to the citizens of the Sebastopol and extended countywide and beyond. In 1972, the organization contracted with the Sonoma County Council (COA) on Aging to provide Day Services at the Senior Center. Day Services was also called the frail elderly program. Around 1995, the COA was experiencing difficulties in financing the Day Service operations of the Senior Center. A finance committee was formed to assist the COA with funding of the Senior Center's activities. During this process, the Finance Committee decided to re-activate the previous corporation which had been inactive, and members of the COA Finance Committee became the new board of directors of the Burbank Activity Center. In 1997 the Board of Burbank Activity Center decided to undertake an extensive remodeling and expansion project of the building that was being used by the Senior Center at 167 N. High Street, where the activities of the Center have been held since the first organization of Burbank Activity Center back in 1969. Fundraising activities for purposes of remodeling and expanding the building were undertaken by the Board of Directors, and an architect and engineers were hired to prepare plans for the project. The remodeling and expansion of the Senior Center building commenced in November of 2001, and was completed in January 2003. It was necessary to relocate the activities and programs of the Senior Center during construction. Arrangements were made with the Sebastopol Grange to move the Senior Center activities to its building, on Highway 12, during construction. The Senior Center moved into the new building in January of 2003. The total cost of construction was $1.4 million, most of which was raised from the community along with some federal and state grants. The project was also financed with a $10,000 contribution by the City of Sebastopol and a $360,000 loan from Exchange Bank. The Exchange Bank loan was paid off with a balance of $54,000 in October, 2011, with private financing. That private loan has now been paid, and there are no encumbrances on the building or property. In February, 2003, the Articles of Incorporation of the Burbank Activity Center were amended to officially change the name to The Sebastopol Area Senior Center. The City of Sebastopol offers limited help with the operation of the Center. Last fiscal year the City contributed $5000 toward an operating budget of over $350,000. This is the only Senior Center in the County that does not receive substantial financial assistance from its municipality. It is therefore necessary that the Board of Directors find other sources of income to operate the Senior Center, primarily with donations from the local community. The programs and activities at the Senior Center have been expanded tremendously over the past 10 years, and ongoing efforts are being made to continually bring in new ideas and programs. 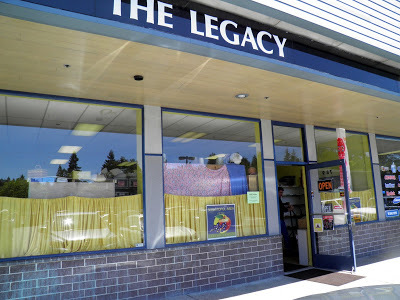 A short time later, the Legacy Store (a fabric and crafts resale shop) was started. Besides the need for money, the impetus for the start of the store came as a result of a gift of an extensive crafts inventory that came from a man in Burlingame whose wife had just died. The decedent was a very active crafts person, and had accumulated a house full of materials and supplies. A resale shop was launched to sell this donated merchandise, and the shop now known as The Legacy was born. That resale shop has continually operated and has grown since that time, and still operates in the Southpoint Shopping Center. All of the profits from go to the Senior Center as a part of and to support their annual budget. In March of 1999, the Burbank Activity Center Board assumed the day-to-day operations of the Senior Center, and continued to contract with COA for the day services. The program continues to be held on Mondays, Wednesdays, and Fridays. The other programs for more active seniors have been expanded considerably so that there is now a full range of activities for seniors of all ages and of varying capabilities.